Sodium Hydrosulfide Market « Global Market Insights, Inc. The expansive consumer spending has encouraged rapid industrialization around the world, fueling the sodium hydrosulfide market size, with increased manufacturing activities giving rise to environmental concerns. Sodium hydrogen sulfide, chemically known as NaHS, has been found to be critical in treating industrial waste and is utilized for effective wastewater treatment to remove heavy metal contamination. Important uses in the leather tanning, chemical processing and mining sectors have been driving the sodium hydrosulfide market growth for many years. However, it is expected that industrial cleaning and waste management would be a considerable revenue source in the near future, owing to the escalating need to prevent river and soil pollution. Individual heavy metals like nickel or chromium can be released from wastewater through precipitation process, an application that has transformed the sodium hydrosulfide industry tremendously. NaHS has gradually earned the position of an affordable alternative for water treatment in metal, glass, printing and ceramic industries. These industries generate large amounts of waste and if it reaches nearby lands or water bodies, it could end up polluting the ecosystem. 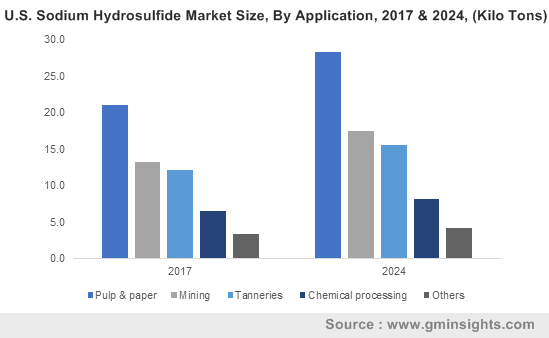 As companies will look to adopt efficient treatment systems for managing their waste, with environmental agencies imposing stringent rules, the sodium hydrosulfide market is expected to garner immense momentum going forward. In essence, meeting regulatory requirements and enhancing the overall community health can be a major driver for the sodium hydrosulfide industry. Asia-Pacific (APAC), in particular, would be needing a greater number of industrial and sewage waste treatment solutions over the next few years, as the region is immensely populated and promises to exhibit an incredible industrialization rate. It is estimated that over 2 billion people would be added to the world population before 2050, with a majority people living in APAC and creating enormous demand for food, consumables and automobiles. A key source of heavy metal contamination in industrial waste is the automobile and associated segments such as glass and battery. Flat glass is commonly utilized across the automotive and construction industries as it can be easily adapted to doors, windows, mirrors, among other parts. Apparently, glass manufacturing and processing requires high purity water and various types of wastewater is generated from mirror production, polishing plants, and other areas. This waste mostly contains several pollutants, including heavy metals, indicating the need for water treatment and a lucrative potential for the APAC sodium hydrosulfide market. Reports predict that by 2025, construction sector would be one of the biggest contributors to the global industrial output, accounting for nearly 13.5% share. China, India and Indonesia would be among the top seven countries in the world that will be responsible for up to 72% of the projected growth, underscoring the massive opportunities in APAC over the forecast period. The region will also witness growing automobile production, a segment which also entails the progress of the glass production industry. Subsequently, the sodium hydrosulfide industry will take advantage of the mounting demand for glass and other products that release hazardous wastewater during production. Worldwide, the speedy recovery of the chemical sector and the rising exports of specialty chemicals has also bolstered the sodium hydrosulfide industry, as NaHS is extensively used for chemical processing by manufacturers. APAC is a well-known chemicals market and China is the main driver of chemicals demand around the globe. In 2016, China had also exported chemicals worth more than USD 54.29 billion, demonstrating its prowess the critical segment, establishing itself as a viable target for the sodium hydrosulfide market. On the whole, the accelerated growth of chemical, automobile and construction industries in APAC region will certainly propel the use of NaHS across the application spectrum, supported by the consistent demand for metals, paper and leather goods world over. Comprising key industry participants like AkzoNobel, Cayman, Genesis Energy, Henan Tianshui Chemical, Merck, Solvay and TCI Chemical, the sodium hydrosulfide market revenue is anticipated to surpass USD 350 million globally by 2024. This entry was posted in Bulk & Specialty Chemicals and tagged Chemical Processing, Form, Global Sodium Hydrosulfide Market, Liquid, MINING, Paper & Pulp, Powder, Purified Grade, Sodium Hydrogen Sulfide Market, Sodium Hydrosulfide Market, Sodium Hydrosulfide Market Size, Solid, Tanneries, Technical Grade.